Washington wide receiver Gee Scott committed to Ohio State on Tuesday and in so doing he became the second receiver in the Buckeyes’ 2020 recruiting class. Gee Scott, Jr. is a 4-star wide receiver out of Sammamish, Washington who caught 48 passes for 654 yards and six touchdowns this past season as a junior, earning First-Team All-State honors in the process. Scott (6-3 211) is a physical receiver with size who attacks the football and then attacks the first-down marker. He also has the ability to break a tackle and do much more than simply move the chains. 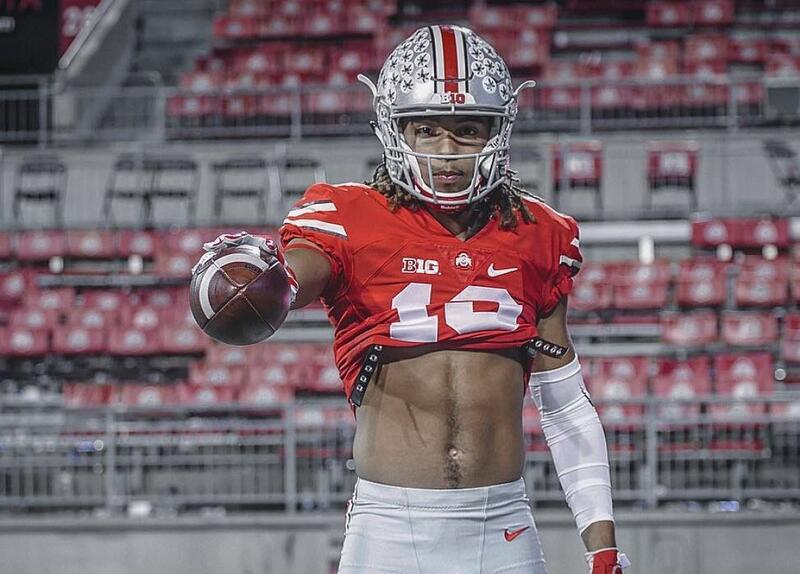 Scott has a similar game to current Buckeye wideout Austin Mack. Mack plays the X position, which is what Scott projects to as well. The X is asked to be the guy to pick up first downs in one-on-one coverage at the sticks. It requires strength, size, quickness, and outstanding hands. Scott has that skill set, and is also dangerous in the red zone, like OSU’s other X receiver Binjimen Victor. Ohio State’s offense requires three starting receivers — the Z, the X, and the H, and three co-starters — so the Buckeyes like to bring in as many receivers as they can in each class to fill out those needs. However, Ohio State has not yet added a projected X receiver in the 2019 class, so Scott could work his way into the two-deep perhaps earlier than expected. When he does arrive, regardless of the depth chart, if he continues to do things like this, he will see the field early. The 2020 season is still a long way off and plenty about Ohio State’s roster will change between now and then. 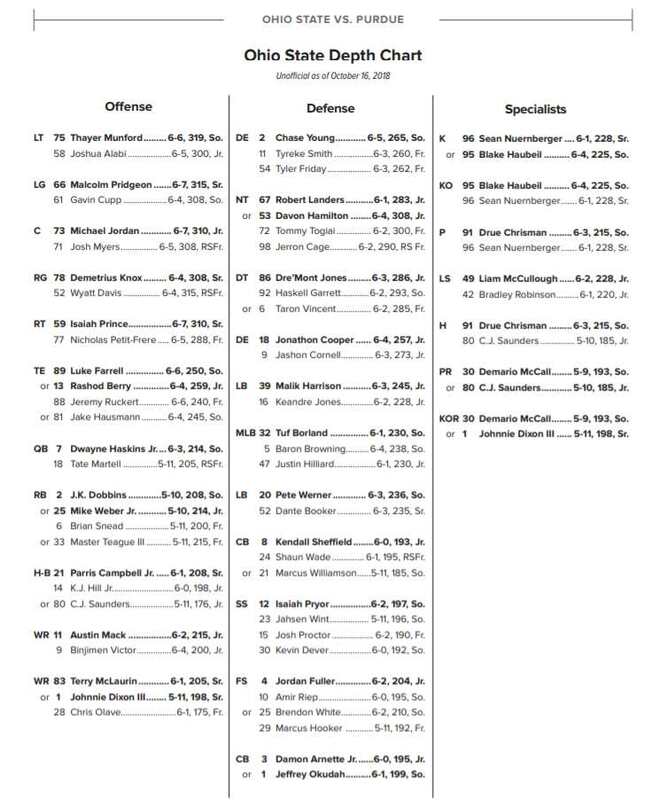 However, if we assume there will be no major disruptions between now and then, the depth chart at X looks a bit unproven. With Austin Mack and Binjimen Victor likely playing their final seasons next year, the 2020 depth chart could be a who’s who of who’s that? Right now, you have Jaylen Harris, Blue Smith, and Ellijah Gardiner as the taller receivers who would be expected to compete for the X position. They have all of four career catches. Those numbers will increase next year, but who knows by how much. Harris, Smith, and Gardiner will all be older and will have more practice reps, but will they use next year to establish themselves as the next in line? If not, Scott could make some noise early on. Hope he has better hands than Victor.